Today's post will look at the remaining aspects of the Medallion Issue of stamps that appeared between 1932 and 1935. All of the stamps of this issue exist in imperforate pairs, like the one shown above. They are all extremely scarce, with only 150 being produced of the low values, 100 of the 13c and 75 of the 20c. In fact, these numbers are lower than the issues that pre-date this and are much more expensive. For this reason, I believe that they will prove to have been a very smart investment to any collector with the foresight to acquire them now, while they are less than $1,000 per pair. In fact, lightly hinged pairs of the low values can be had for as little as $350, which is a pittance for anything this scarce. 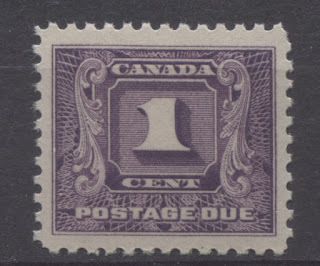 The 3c value can be found in both dies 1 and 2, with the die 2 being found only as a flat plate printing, and being the rarest and most valuable of all the imperforate pairs. It currently lists in Unitrade at $3,750 in VFNH condition. In preparing for our move to New Brunswick, we have decided that the time has come to offer a large portion of our classic stamps to collectors at significantly reduced prices. Until November 17, 2016 all our mint hinged stamps and a few of our used and NH stamps will be offered at 25% off our regular prices. This means that a stamp that lists for $100 in Unitrade, is now priced for between $45 and $75 depending on the exact grade. Also, at the present time we are not required to charge HST on our sales. This will soon change, but for now Canadian buyers have an opportunity to acquire some very desirable stamps at substantial savings from what most dealers will charge, after HST is factored in. Also remember that we only charge once for shipping, no matter how many stamps you buy. So if you live in Canada, you pay a flat 85 cents, and anywhere else a flat $2. My apologies to those of you who were checking the blog and expecting to see a post on October 10. I returned from my honeymoon in NYC on the 9th and it has been pretty crazy around here ever since. So without further delay, I will discuss the remaining aspects of these issues that were not covered in my first post.